Remote mountain location. Thirsty children. Parched crops. Limited access to water. The Lenca Indians are a beautiful people. Direct descendants from The Mayan dynasty, they live and work primarily as farmers in northern Honduras in the Marcala region, close to the El Salvadoran border. At an elevation of 6,500 feet above sea level, water access and distribution is challenging, and during the long dry season, this life-sustaining element becomes a precious and scarce commodity. Local villager working with TerraMica on the pipe repair from the water source to the reservoir. literally going without water for up to 5 days. The water that was available was being brought in from miles away in very limited amounts, and supply was sporadic at best. Our U.S. staff quickly reached out to family and friends for help …. The response was amazing and the resulting effects rippled through a drought weary community where 20 farming families were hanging in the balance. We are happy to report that the repairs have been completed, and the water supply to the 20 families of San Jose de Guajiquiro has been re-established. TerraMica’s Jorge Sosa has administrated and overseen the project, along with the water board of San José de Guajiquiro, ASOMAINCUPACO (a partner NGO working in the area). Each of the impacted families has had a story of heartfelt gratitude to share with TerraMica’s staff. 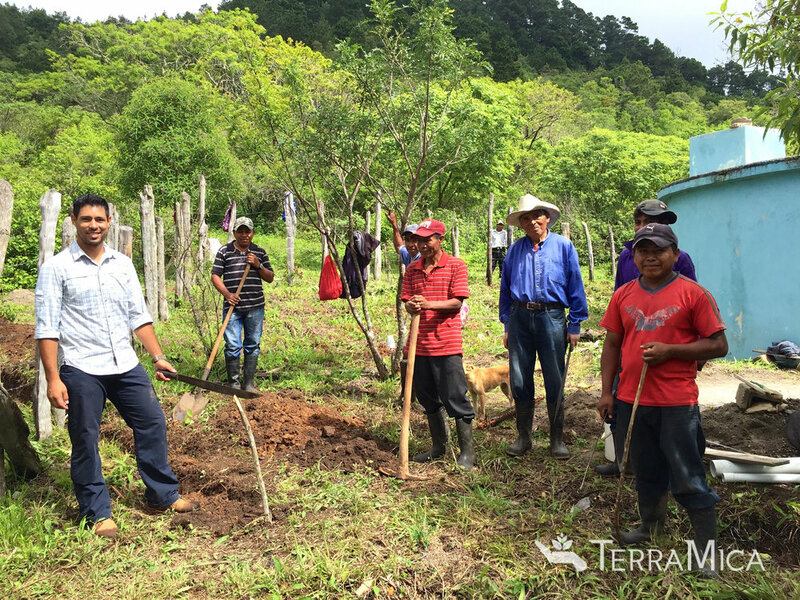 Because of you, our friends and supporters of TerraMica, we collectively were able to pour out love in a tangible way that flowed down upon a small farming village in desperate need. Gathering together and donating to this emergency water project has made all the difference for these 20 Lenca families. We are pleased to say that a number of couples gladly stepped in to meet this critical need. Special thanks go to Duke & Shelley LaLiberte, Brie & Ryan Baker, Jeff & Debbie Hansen, Shawn & Mark Cassas, Andrew & Marcie Apffel, and Jan & George Strickland. These couples donated funds as part of a Mercy Project to meet the emergency need to supply water to families in need. Jorge on water tank with a local man who participated in the restoration work with TerraMica. You cannot imagine the importance of water to survival and health … until you have none. Impacting the lives of families by providing water is an incredible privilege. We look forward to continuing our work with this community in developing new and improved methods of clean water supply. You’ll be hearing more about our long-term plans in the near future. Please consider being part of our future clean water project for all the families of San Jose de Guajiquiro! There is still so much to be done in this community!